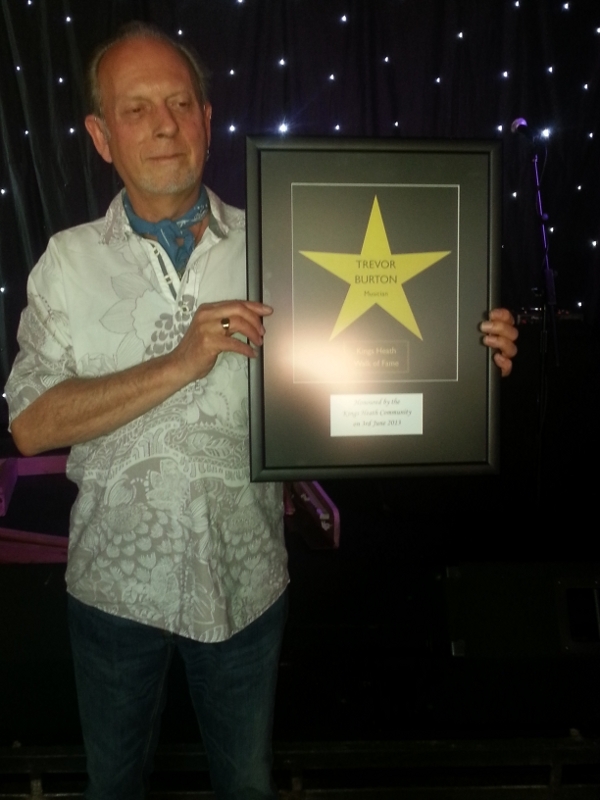 A true Birmingham Rock legend Trevor Burton who has lived in King's Heath for over 20 years became the second star to be inducted on to the Walk of Fame at an Award Ceremony at the Hare & Hounds on Monday 3rd. June. He then went on to play two sensational sets over three and a half hours to a jam packed room of over 250 fans in the evening. 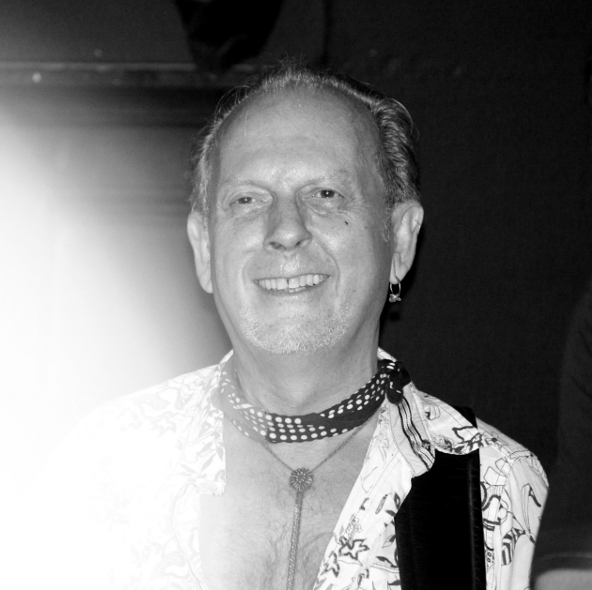 Trevor was a founder member of the The Move – the first Birmingham super group of the 1960's - who were formed after a young David Bowie advised Trevor to gather together all the best Birminghanm musicians together into a supergroup and come down to London to play. Trevor taught himself to play guitar by ear when he was 7, formed his first group at 13 and turned professional when only 15 when he joined Danny King and the Mayfair Set before moving down to London with Roy Wood, Bev Bevan, Carl Wayne and Ace Kefford. 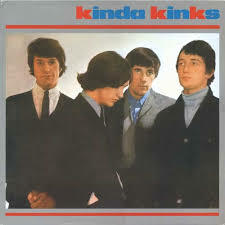 The Move then went on to score nine Top Ten hits including “Flowers in the Rain” - the first single ever played on Radio One. When Trevor left in 1969 with “Blackberry Way” at No.1 in the charts he formed another short lived super group called “Balls” with Noel Redding from the Jimi Hendrix Experience, Denny Laine from The Moody Blues, Alan White from the Plastic Ono Band and Steve Gibbons. He then went on to tour extensively as a member of the Raymond Froggatt Band , international stars on the country and western scene, and then with The Steve Gibbons Band when they scored their Top Ten hit “Tulane” and toured the U.S.A. supporting The Who. He was presented with his star by fellow KIngs Heath based musician Steve Ajao before a large crowd of fans, family, friends and fellow musicians at an Award Ceremony held at 4 p.m. He then went onto play a concert to over 250 fans in the evening as part of The Trevor Burton Band and then as part of his current version of The Move featuring fellow founder member Bev Bevan. 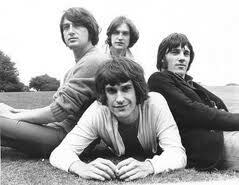 Bev Bevan, drummer with The Move and ELO, said “ Trevor is a fantastic blues guitar player. He left The Move to pursue his love of blues music and went on to play with Jimi Hendrix and many other great stars. He is a very committed musician and always gives a hundred percent on stage. His star is a great reward for all his really inspirational playing”. Local residents Bob Prew and Ken Whittaker who came up with the idea of the Walk of Fame said, "We are delighted to be able to honour Trevor with a star. He formed the first major group to come out of Birmingham in the 1960's and has now lived in King's Heath for over 20 years. He is still a really influential figure on the rock and blues scene today inspiring a whole new generation with his guitar playing". Defiant organisers of the Walk of Fame said that the fire that recently destroyed the former Ritz Ballroom will not halt their plans to celebrate King's Heath's amazing musical heritage this summer. June 9 - Rock 'n' Roll Revival commemorating the 50th Anniversary of Gene Vincent playing The Ritz. Jerry lee Lewis and Bill Haley are also known to have performed there. Aug 4 - Girls Afternoon Out commemorating, Dusty Springfield, Sandie Shaw, Helen Shapiro and Cilla Black who all played at the Ritz. ♦ an all day Rolling Stones Fest on Saturday 14 Sept at Fletchers Bar and other venues around King's Heath to commemorate the 50th Anniversary of the Stones gig at the Ritz with films as well as live and recorded music. The first ever Birmingham Civic Society Music Heritage plate (photo opposite courtesy of Ell R Brown) commemorating the Ritz Ballroom has survived the fire and these summer events are intended to keep the music and memories of the 1960's alive while the future of the building is decided. 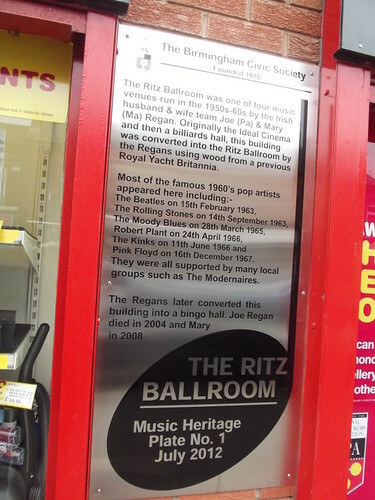 Organisers Bob Prew and Ken Whittaker said, “The Ritz Ballroom building may have been destroyed but we are determined that the memories and music will carry on. It is vital that the key role the Ritz played in Birmingham's musical heritage is not forgotten. All the great bands of the 1960's played at The Ritz. These live events will keep the spirit of The Ritz well and truely alive”. Both Toyah Willcox's pavement star and the Birmingham Civic Society Misic Heritage Plate have been removed for safekeeping while the whole building awaits demolition.